If you were hoping for a straight forward qualifying for the Hungarian Grand Prix, then you would have been disappointed with what was delivered. The heavens opened and rain poured down to mix up the order and bring out multiple red flags during the first session. If you were looking for something chaotic and unpredictable, then what unfolded during the three knockout sessions would have been right up your street. Read on for lap by lap coverage of qualifying as it happened, following the drivers that crashed out, those that spun, and those that earned themselves a coveted grid spot. Hi there, fact-finding fiends, how have you been? It's two weeks since our last F1 adventure and the circus has moved on to Hungary. Today is qualifying day, and whaddayaknow, it's raining. There were dark clouds looming over the track earlier, and they finally broke to produce an epic pourdown. With half an hour to go until qualifying, we can only hope it clears up a little to allow the sessions to start unhindered. Meanwhile, what's been happening? Mercedes have the edge in practice as you might expect. Nico Rosberg is buoyed by the announcement of his contract renewal, and he's led the last two practice sessions. Much has been made of Hamilton's crash in FP3, but he didn't do too much damage to the car and was released from the medical centre after obligatory checks. He was fourth in final practice this morning, but has a very good record around the Hungaroring. Anticipating the use of these two tyres for qualifiyng today. The FIA have made their presence felt this weekend, with a clampdown on track limits via some electronic measuring, plus yet another tweak to the ban on radio communications. After Rosberg's penalty in Silverstone, they've revised the rules so that teams are allowed to give information but only in the pit lane, so a driver would have to pit if there was a significant problem, or wait until his next stop to hear about it. Tweet from @ManorRacing: Now look! We only wanted the heat to break a little bit. It was not code for "Bring out the Ex Wets"
There's also been good news this week for Sauber, of course, who have been saved by an investment company and given a new lease of life. Monisha Kaltenborn has been smiling her way around the paddock by the looks of things, and she's already talking about the upgrades the team will bring to take the fight to Manor before the end of the year. Sauber are currently on zero points in the constructor's championship, whilst Manor picked up a single point thanks to Pascal Wehrlein's tenth place in Austria. Karun Chandhok in the paddock, after a glimpse at the Renault radar: "They aren't expecting big rain anymore, they're optimistic the session is going to run on time." Contrary to Karun's predictions, the weather has moved in again so there's thunder and rain and all sorts. Still no sign of the umbrellas being put away. Tweet from @pirellisport: What’s going to be interesting is to see how the new track surface reacts with the heavy rain. We’re heading into unknown territory! Tweet from @Max33Verstappen: It's pouring rain! Tricky conditions but also lots of fun! Going to be an interesting qualifying. Start of session delayed by ten minutes. Tweet from @ForceIndiaF1: Checo talks strategy with our engineer Jun. Tough call between wet tyres and a dinghy. The safety car is out and about for a tour of the circuit to see conditions. There's quite a lot of spray being kicked up as it goes. Another ten minute delay, which isn't a surprise looking at some of the puddles the safety car is dealing with. There's the odd mechanic out in the pit lane trying to dry up their areas of tarmac with those oversized hairdryers. That may take a while. Session due to start at 14:20 local time. Alonso is being strapped into his McLaren, it looks like we might actually be going soon! There's a queue at the end of the pit lane now. 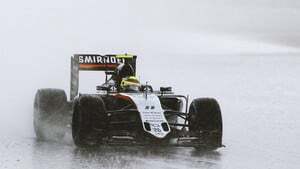 Team radio to Sergio Pérez: "Chance of more rain after five minutes." There's quite a lot of spray out there, as Felipe Massa leads the way on the first set of laps, he's got the best view but also hits the puddles first. Round the final corner, he has a wobble but straightens up to cross the line for his first flying lap of the session. Massa sets the first lap tim, quickly beaten by Hülkenberg by more than a second. There's a big discrepancy in the times here, and there's more significant rain moving in. Pérez moves into P1, almost matching the time of his teammate. Two Force Indias at the top at the moment. Both the Mercedes drivers backed off their laps, so they've set times but they're seven seconds off the pace. Only Haryanto is slower. Team radio from Sebastian Vettel: "Honestly, it's too much water for these tyres." The Ferrari driver is just slowly making his way back to the pit lane. Up front we have Pérez, Hülkenberg, Alonso, Nasr and Ricciardo. I think almost everyone is hoping they have to cancel qualifying and we start with that grid. The safety car is on its route again, looks like the rain has stopped for a time again but there's still plenty of water on the ground. Tweet from @HaasF1Team: Safety car's heading back out to slip and slide around the Hungaroring. Still extremely wet. Session will restart at 14:40. Not much warning there, but the teams are ready and cars are already making their way to the front of the pit exit queue. Looks like Mercedes got there first, they've got some work to do. It's a Red Bull, in fact, up front, with Hamilton sitting behind him. Track is clear - 13:08 on the clock. Hamilton reports some smoke from the car after a lengthy wait at the pit exit but it was probably just steam as he gets away fine as the session resumes. The outlap looked comfortable enough but as Max Verstappen kicks off his flying lap, the Red Bull is snapping around underneath him. Standing water is clear at every point on the track. All cars are out on track bar Pérez and Hülkenberg up front, as well as Jenson Button who is currently 12th. The two Force Indias head out of the garage as Verstappen heads up to the top of the times. Yellow flags as Marcus Ericsson's Sauber is tucked into the barriers. Team radio from Marcus Ericsson: "It's over, it's over, sorry." There are tyre tracks through the gravel, and the Sauber is sideways on into the barriers, with the advertising hoardings falling over onto the car. Ericsson is out fine though. Meanwhile, Alonso had set the fastest first sector of the session so far but was unable to finish his lap due to the red flags. Replays show there was little Ericsson could do, the rear of the car just snapped away from him hitting a puddle. Nine minutes exactly left on the clock, so still plenty of time for the order to change. As Ericsson's Sauber is being hauled away, the sun comes out over the circuit. At this point in proceedings, we'd normally be eyeing Q3 and predicting who'd be on pole, but it's such a crazy day we're still only halfway through Q1! Session will restart at 14:55. Cars pour out of their garages again to line up at the end of the pit lane. Felipe Nasr was out first as the session resumed, and he's got all the hopes of Sauber on his shoulder now. Marcus Ericsson made it back to the pit lane and hopped up on the pit wall for a mini debrief. The Red Bulls and Sebastian Vettel have gone out on intermediate tyres, whilst the rest of the field have remained on the full wets. The two Haas drivers have opted for intermediates as well, a few green striped tyres in amongst the blues. Lewis Hamilton runs straight off track and over the gravel. He keeps it out of the wall but rejoins with dirty tyres and a lack of momentum. Yellow flags as Felipe Massa has crashed into the barriers. Massa was on the intermediate tyres, so that's a gamble that didn't pay off for Williams. As Nasr was out first on track and managed to complete his lap before the red flags, he managed to zip up to P1 ahead of Daniel Ricciardo. 5:20 left on the clock, which is starting to cut it fine to get a decent lap in. Marcus Ericsson: "It’s not so easy to drive but Felipe was out there as well and he didn’t crash. It’s disappointing, it’s my mistake, so I need to fight back tomorrow. We’ll have to see how damaged the car is but hopefully not too bad." Felipe Massa is back in the pit lane now, walking back to the Williams garage, and he looks very disappointed. Session will restart at 15:07. Track is clear. Another huge queue at the end of the pit lane as the session gets underway AGAIN. How long for this time? All drivers out on track are on intermediate tyres now, hopefully the track is dry enough for them to complete a full lap with them on. This time it's Rio Haryanto who has crashed out. The Manor is sitting in the grass with one wheel hanging off. There's only 1:18 on the clock now, so no time for anyone else to set a time. Session will not be restarted. Tweet from @ManorRacing: A fourth red flag, this time for us, as @RHaryantoracing spins off and has a big coming-together with the wall. He's okay though. Holy moly, we might actually have made it to Q2. Sebastian Vettel leads the queue at the end of the pit lane. It's intermediate tyres all round. Drivers heading out super early in this session, hoping to set a banker lap in case of chaos, understandably. Vettel runs deep into a few corners as he starts his first flying lap, but he's got it under control as he watches the kerbs and the puddles. Vettel sets the first lap time with a 1:34. Bottas settles in behind him, as does Räikkönen. Carlos Sainz goes faster. The two Mercedes drivers come out and take up their more natural position at the front of the field, dropping the times to a 1:32. With one lap on the board for everyone, the drop zone features Nasr, Bottas, Kvyat, Gutiérrez, Alonso and Pérez. Button's first effort was good enough for seventh. Daniel Ricciardo overtook the Mercedes to take up a P1 position, whilst Verstappen made it a Merc sandwich in fourth. Alonso's second lap was good enough to move ahead of Pérez but the pair are both still in the drop zone. Valtteri Bottas has bolted on slick tyres, the first driver to do so. It's a set of supersofts for the Williams driver. Hamilton has P1 at the moment, with 1:31.5. Max Verstappen storms across the line but he's a tenth of a second down. Fernando Alonso has also gone for the red tyres. Williams and McLaren clearly feeling they've got nothing to lose here. Team radio to Jenson Button: "Box this lap and we'll get three on dries." "It's so difficult. Box this lap but it's so difficult. There's still a lot of wet patches." Onboard with Bottas shows it is manageable on the dry tyres but the Finn is working hard to keep control. Plenty more drivers are taking on slick tyres now, despite Button's concerns. Bottas crosses the line for P1, a good call for Williams that one. Felipe Massa: "I think it was the right choice, many cars was already trying to do the same choice. They were all improving straight away. I think it was the right choice, unfortunately I just lost the car in corner four, aquaplaning, but the three corners I did before it was okay. These things can happen, I feel a shame for what’s happened." Alonso was fastest briefly there, but Pérez topped him. The times are dropping rapidly now. Sebastian Vettel has gone fastest now, with Romain Grosjean squeezing into second place. Then Alonso tops the times again. Lewis Hamilton moves up to second but is four tenths off Alonso's pace. With two minutes left, the drop zone features Bottas, Gutiérrez, Ricciardo, Nasr, Räikkönen and Kvyat. Kimi is on a hot lap right now. Räikkönen hauls his Ferrari to fourth and relative safety, which drops Sainz into the bottom six. Ricciardo, on a hot lap, ran wide off track and lost a handful of time. He should be able to make it back to the line for one final push. Team radio to Daniel Ricciardo: "Push on the final lap, regardless." Räikkönen improves again to move up into P1. Sainz knocks seven tenths off the Ferrari's time, and then loses six himself to Vettel. And Alonso again pops up in P1! Rosberg dropped down to the bottom six, but he improved to P1, a full second ahead of the field. The times were dropping so rapidly that Hamilton has ended up tenth, that's a lucky break for the Mercedes driver. Both McLarens are into the top ten, the first time since 2014! Q3 will start at 15:43. Less of a queue at the end of the pit lane this time, with just ten cars ready to compete and a much drier track, there's likely to be less carnage. The dry line is clear from the helicopter shots, as seven of the ten drivers head out to start their campaign. Nico Rosberg crosses the line to set the first time of the session, but Hamilton is hunting him down and quite easily moves ahead of his teammate. Fernando Alonso is two seconds off the pace for third, and Button is similarly off the pace but sneaks ahead of his McLaren teammate. Vettel and Bottas become the final pair to leave the garage. Ricciardo runs wide at the final corner, kicking up some spray. He keeps control and crosses the line for third. Sebastian Vettel moves up to fifth with his first lap, whilst Bottas remains down in tenth place. Daniel Ricciardo improves this time round, sits third but just a tenth of a second off the Mercedes pair. Replays show Vettel repeated Ricciardo's trick at that final corner. The drainage isn't working on that kerb so there's excess water, Vettel snapped towards the pit wall but straightened up to cross the line. Brief stop at the pits for most of the drivers, before heading back out for the final two minutes of the session. All ten cars are out on track. Hamilton crosses the line in plenty of time to start his flying lap, hoping to retain that provisional pole position. Yellow flags as Alonso has spun. Replays show it wasn't even a wet track situation, he just lost control and spun it. He's able to continue but it will have ruined a lap or two. Rosberg has managed to cross the line for P1 somehow! Amazing. He'd already passed the Alonso incident and kept control for a time two tenths ahead of his teammate. Pole position for Nico Rosberg with a time of 1:19.965. Hamilton looked to be on for a faster lap time but did get held up by the Alonso situation. Awkward. A crazy but exciting qualifying finally drew to a close, then, with Rosberg on pole position. There are some questions about who was where during the final yellow flag situation. Although they couldn't do much with it in the final qualifying session, it was great to see both McLaren's up in the top ten and it should give them something to fight for tomorrow. Meanwhile, Felipe Massa is going to have it all to do to come from the back, and once again, it will all depend on what the weather does! I'll be back tomorrow to cover every lap of the Hungarian Grand Prix, so do join me then!